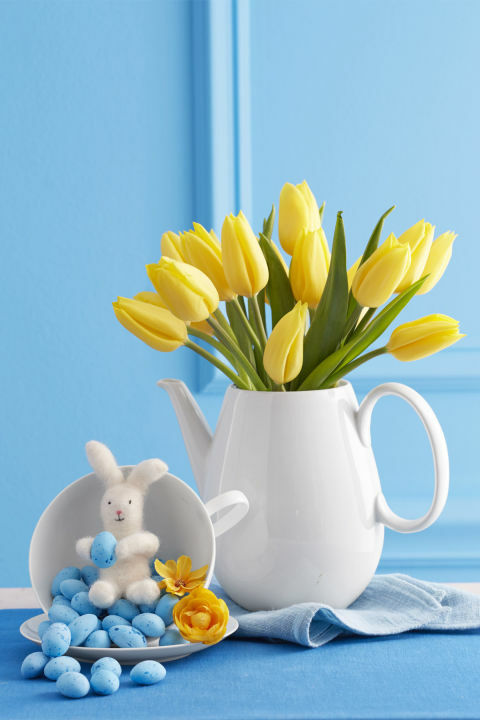 Easter is nearly here and if you’re not in that festive mood yet, these Easter table decorations, with a variety of spring flowers and colored eggs, are sure to get you into it. 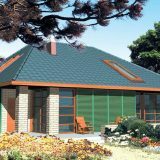 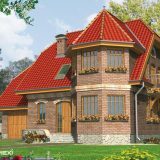 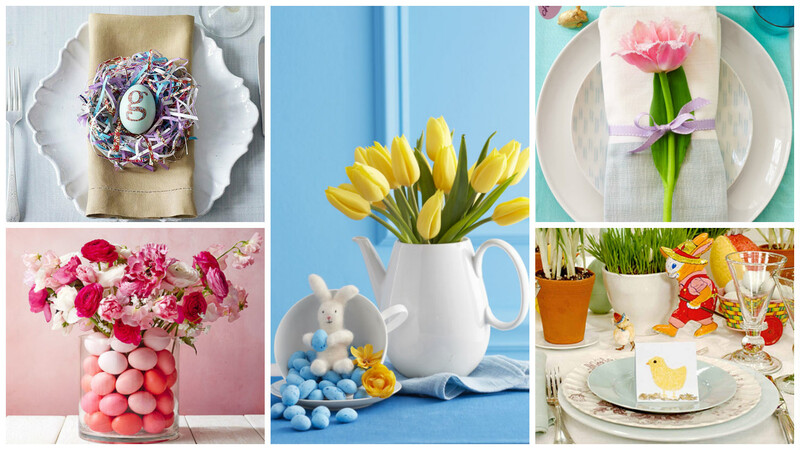 You have some nice family meals or even a small gathering of relatives and friends to look forward to, so why not make the most of it and create a special atmosphere for everyone? 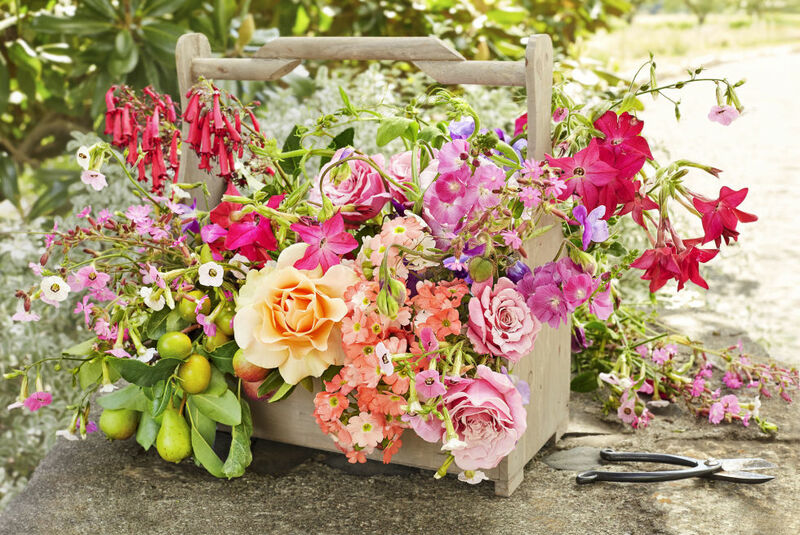 This old toolbox has the ideal size to hold a flower arrangement for a beautiful Easter centerpiece. 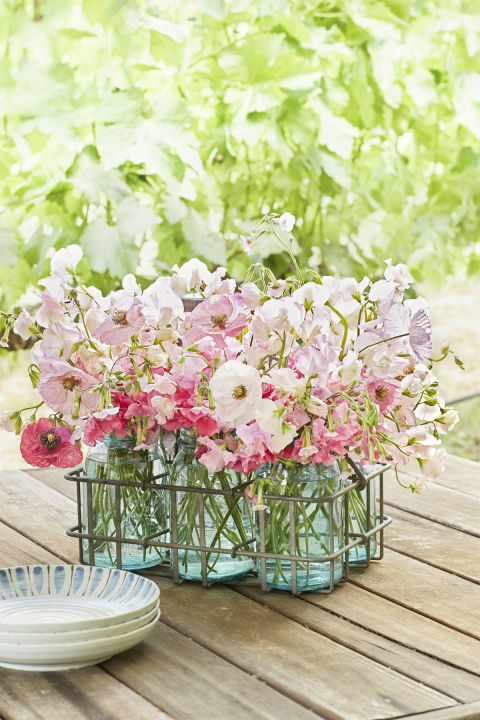 Gather vivid flowers in similar tones in a ribbon-trimmed, whitewashed peck basket. 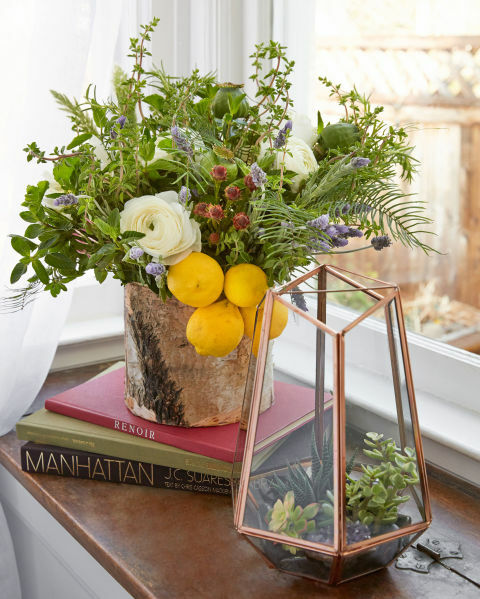 This delightfully overgrown bouquet amps up its rustic design when placed in a birch vase. 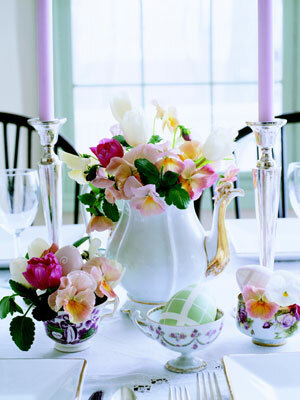 Easter brunch will be both elegant and informal with a centerpiece composed of sweetly mismatched tea sets. 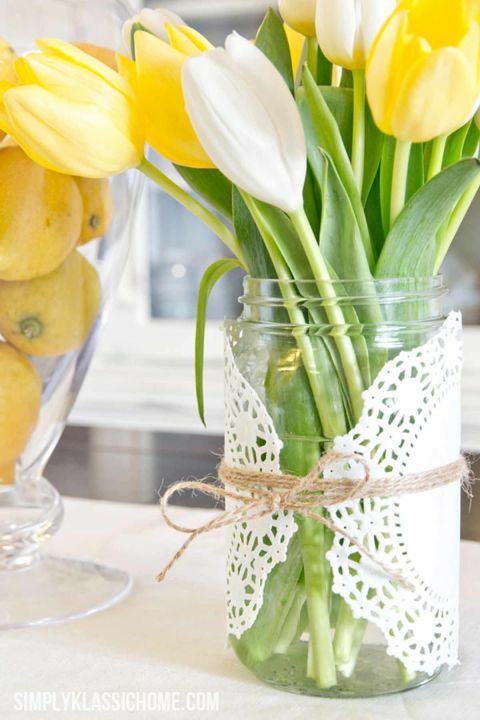 Turn a quartet of greeting cards into a sweet sleeve to slip over a vase. 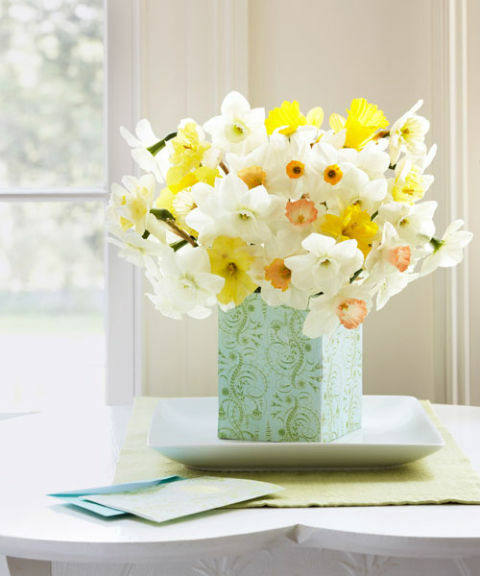 arrange white and yellow daffodils to make a matching square bouquet. 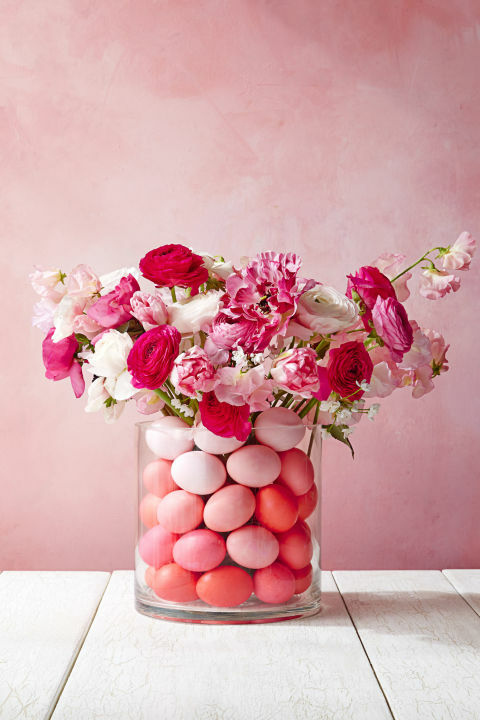 Put a small jar with water and spring flowers in a larger glass container filling the space left with colorful Easter eggs. 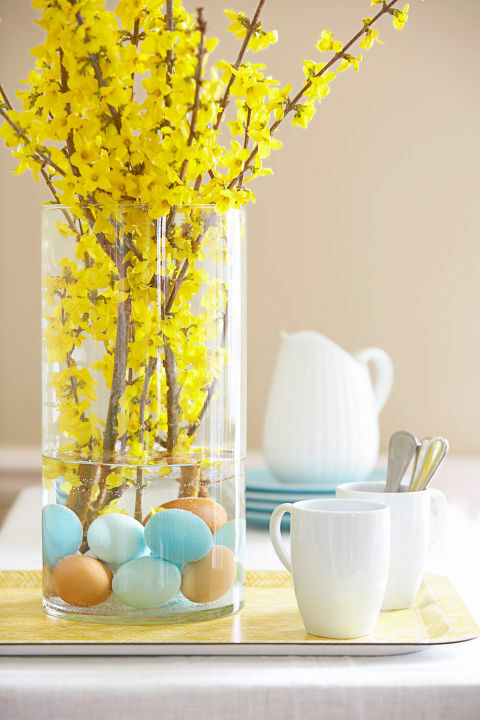 Anchor brilliant forsythia — and give a tongue-in-cheek nod to Easter — with subtly hued hard-cooked eggs. 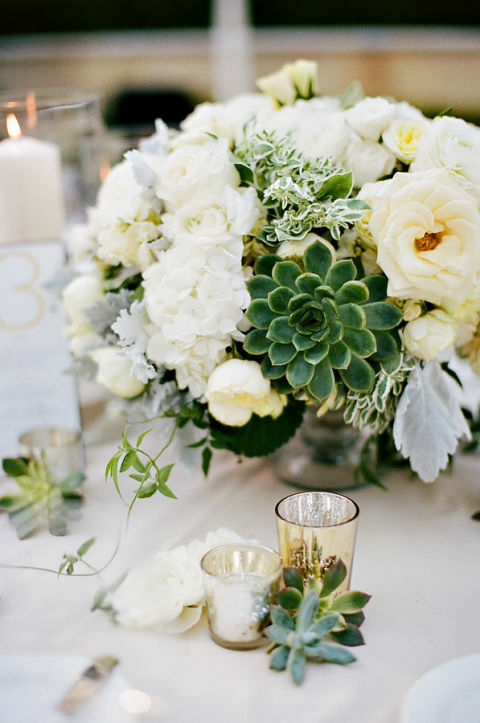 Adding jade green succulents to an otherwise all-white centerpiece adds color and texture and they’ll last forever too. 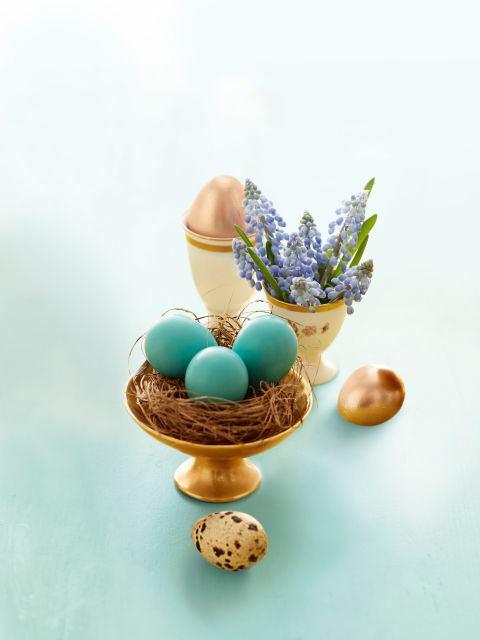 Line your table with eggs (and nosegays) in matching or mismatched eggcups. 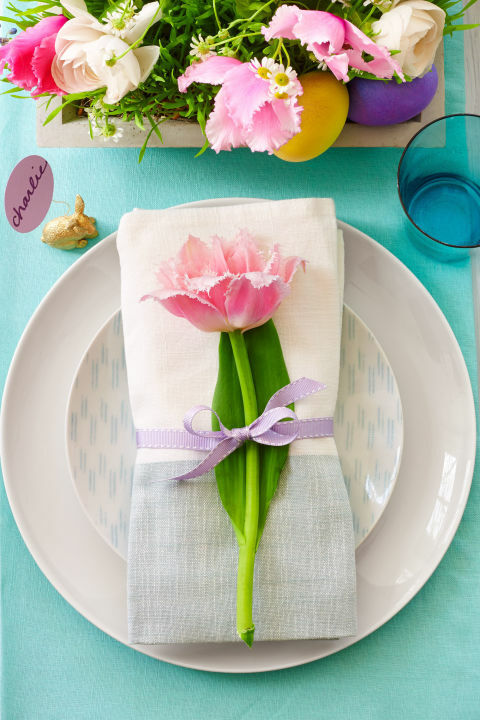 Create a place setting that’s undeniably Easter with a paper-strip nest. 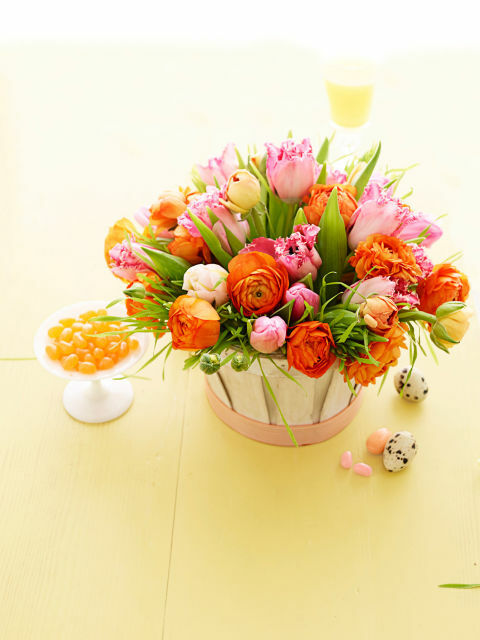 Take a myriad of colored scrapbook papers and shred them into tiny strips (a paper shredder works best). 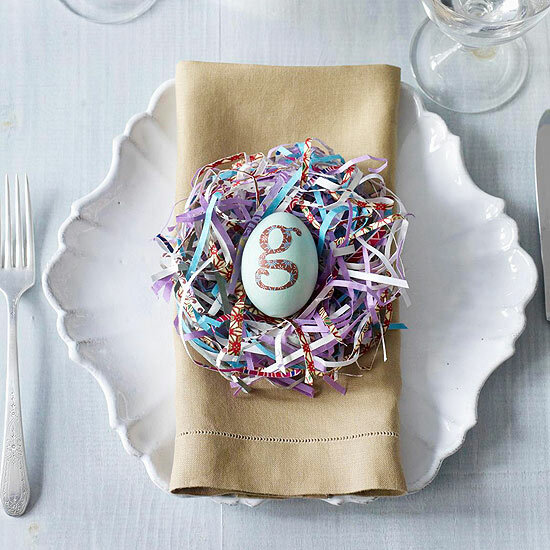 Form the paper strips into a ball large enough to fit an egg. 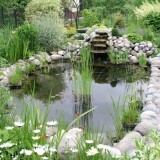 Place an egg in the center of each ball, forming the strips into a nest around the egg. 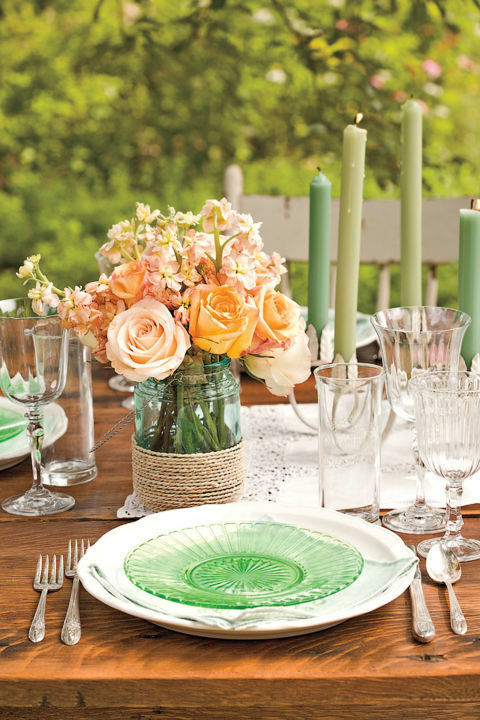 Let each guest know where they’re sitting with a pretty monogram sticker. 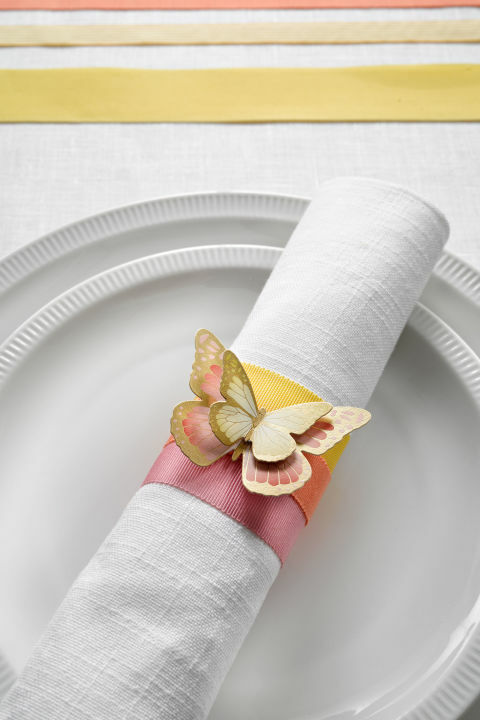 Or use pastel ribbons and colored paper butterflies to make pretty napkin rings like this one. 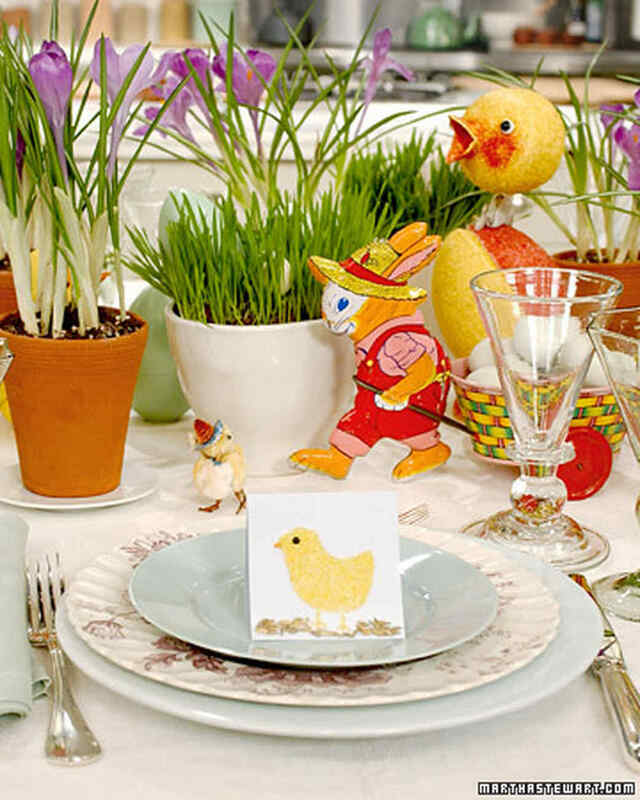 Add an especially festive touch to your Easter table with whimsical place cards bearing chick, bunny, or lamb designs.